(vIRRirundhu) AzhwAr says “emperumAn is seated on the anathabhOgi (AdhiSEsha) in SrIvaikuNta (paramapadham, spiritual realm) along with SrI mahAlakshmi, being served by countless servitors such as AdhiSEsha, vishwaksEna, vainathEya et al; after having seen such emperumAn with my [present, material] eyes by his infinite grace, saluting him to the full satisfaction of my hands, and singing thiruvAimozhi with my mouth, what shortcoming do I have [i.e., I have no shortcoming]?”. His control over all worlds. His lakshmIpathithvam (being the lord of SrI mahAlakshmi) which is the cause for his control over all worlds. His having qualities such as bliss etc which are known from the previous two points. His having vAhana (vehicle) and Ayudha (weapons) which help him protect those who enjoy such qualities. His providing of knowledge and devotion to facilitate such enjoyment. His distinguished form which is enjoyed by those with unshaken intelligence. His supremacy in all situations without a matching or more superior person’s presence at any time for such enjoyment. His togetherness with ubhaya vibhUthi (spiritual and material realms) which brings in such supremacy in him. His omnipresence in such realms etc. His attractive actions which are present for the protection of those pervaded entities. Meditating upon these aspects, out of the joy acquired in enjoying such complete sarvESvara, singing his glories as done by nithyasUris, AzhwAr, thinks about the rare occurrence of getting such experience in this [material] world itself like a lotus flower blooming from a stove [which is impossible], mercifully reveals the pride he acquired thinking “Is there any one equal to me?”. AzhwAr who grieved so much in the previous decad is saying “ini enna kuRai ezhumaikkumE” (From now onwards, forever I have no worries!). Starting from thiruviruththam 1 “poy ninRa gyAnam” (ignorance) upto the beginning of previous decad, they are emperumAn‘s efforts to create the craving/grief in previous decad “maNNai irundhu thuzhAvi“; the result of creating such craving in AzhwAr is explained in this decad. For the goal, there is nothing more to be explained beyond what is explained here. nanjIyar would mercifully say “After thiruvAimozhi 10.9 decad ‘sUzh visumbaNi mugil‘, this decad should have been present”. When [sIthA] pirAtti was with perumAL (SrI rAma) and iLaiya perumAL (lakshmaNa), she became separated [from them], [SrI rAma] went along with [sugrIva] mahArAja and his entourage, destroyed the enemies and united with pirAtti; similarly, to remove the distress of AzhwAr who was bewildered by seeing similes of emperumAn, emperumAn completely manifests his nature of being with nithya vibhUthi and leelA vibhUthi, to AzhwAr and says “Can you see my nature? These possessions will become complete, only when you praise me with your words” and hands over a thALam (cymbal) to AzhwAr, and AzhwAr sings mangaLASAsanam (well-wishes) to him. For his bewilderment of thiruvAimozhi 4.4.4 “ninRa kunRaththinai nOkki” (looking at the tall mountain), emperumAn shows himself who is “vAna mA malai” (huge mountain from paramapadham); for his running behind people thinking they were emperumAn‘s devotees as said in thiruvAimozhi 4.4.7 “nIRu sevvE idak kANil nedumAl adiyAr enRu Odum“, emperumAn manifested the nithyasUris to him as said in thiruvAimozhi 4.5.4 “thUviyam puLLadiyAn adal Azhi ammAn” (emperumAn who rides garuda and has the sudharSana chakra); for AzhwAr saying in thiruvAimozhi 4.4.2 “seyyadhOr gyAyiRRaik kAttich chirIdharan mUrththi Idhu” (showing the bright sun and saying this the form of SrIdhara), he manifested his divine presence with SrI mahAlakshmi in thiruvAimozhi 4.5.2 “maiya kaNNAL malar mEl uRaivAL uRai mArbinan” (one who has dark-eyed, resident of lotus flower SrI mahAlakshmi on his chest). 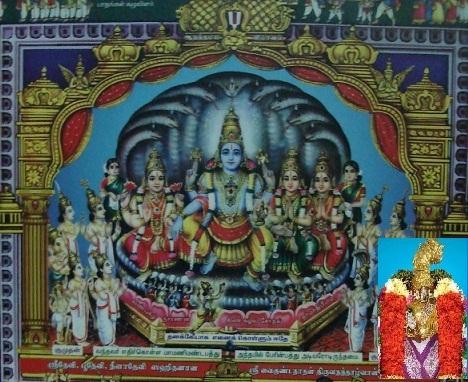 For AzhwAr saying in thiruvAimozhi 4.4.8 “thiruvudai mannaraik kANil thirumAl” (When she sees wealthy kings, she says “SrIman nArAyaNa”), he showed his opulence of being the lord of spiritual and material realms; From someone else [AzhwAr’s mother] saying “en seygEn” (what shall I do? ), emperumAn changed AzhwAr to say himself “enna kuRai ezhumaiyum” (what limitation I have forever? ); for AzhwAr who became bewildered seeing mild bliss as said in thiruvAimozhi 4.4.9 “virumbip pagavaraik kANil viyal idam uNdAn” (When she sees ascetics, she says they are forms of one who consumed the worlds), he manifested his blissful form as said in thiruvAimozhi 4.5.3 “vIvil inbam miga ellai nigazhndha nam achchudhan” (Our achyutha who is with the ultimate bliss). This entry was posted in thiruvAimozhi, thiruvAimozhi 4th centum on February 16, 2017 by Sarathy Thothathri.